But I collect the things that don’t cost much. Sometimes they’re even free. I’m a fanatic for sea glass. While other people are combing the sand for almost non-existent perfect sea shells. I’m looking for bits of broken beer bottles. 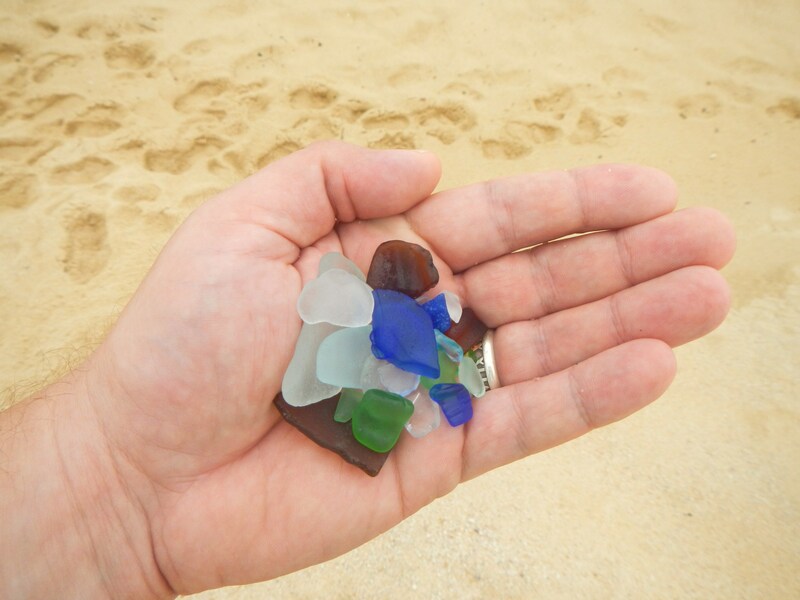 After a few months, or even years, of tumbling around on the ocean floor pieces of broken glass are rubbed with sand to a beautiful, soft finish. 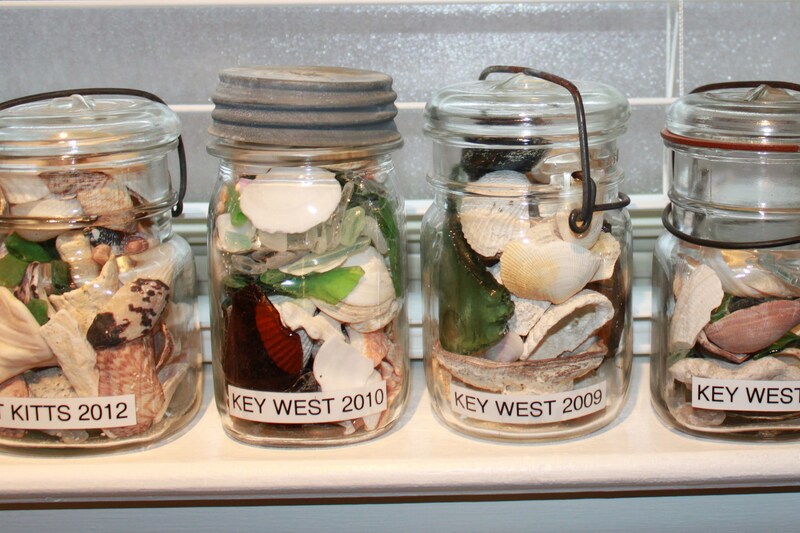 The dirtier the beach, the more likely it is to find….and it doesn’t take me very long to collect a decent handful. Technically, it’s trash. But I think it’s beautiful. I grab a vintage canning jar from a junk shop before we take a beach vacation. One of my favorite haunts is Curiosities in Lakewood. They are usually about $4. I prefer the ones with either a zinc screw-on lid or a hinged glass top. Since I buy a different on for every trip they are all slightly different. I like that. looks collected. I’m pretty sure that you do. Here they are lined up like soldiers on the bedroom window sill. Bits of coral, shells, sea glass (of course), bottle caps, even a peso I found………. 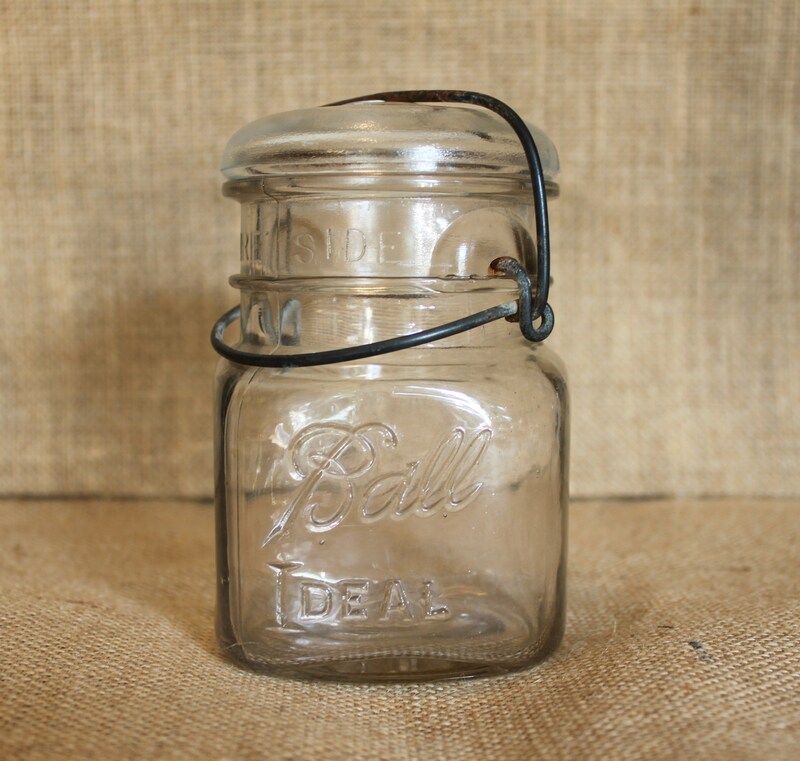 look more like treasured objects in vintage jars. Someday they will make it to the master bathroom across the window on glass shelves. Reminds me, we should do something about that master bathroom. Love these jars. Beautiful idea. Now, if I could just go to the same destinations! Mary Ann, I don’t buy t-shirts, I pick up trash…. Doesn’t have to be exotic, I think this same kinda thing could work with a walk in the woods, around a lake, I’d say National Park, but I thinks that’s illegal…..
What a coincidence as today I picked up polished glass from a small beach that my dog likes to swim at. I scatter mine around my outdoor cactus plants. OOh I LOVE that idea too!!! Have recently discovered your blog and am loving your home! 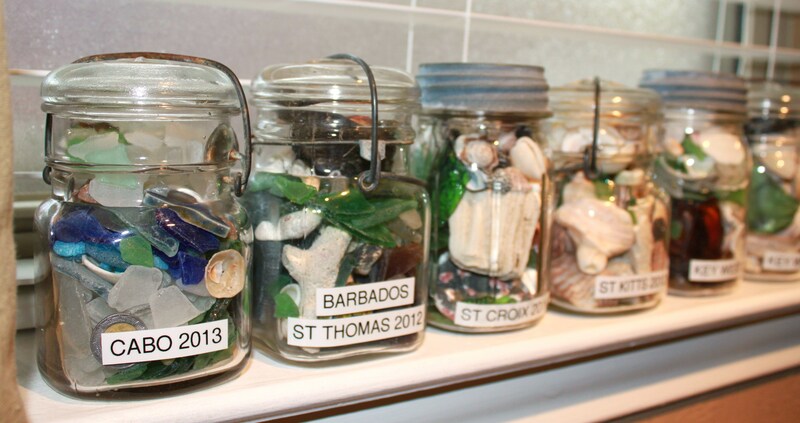 This is such a cool project, love the glass jars and the idea of having the memories of your travels as keepsakes. 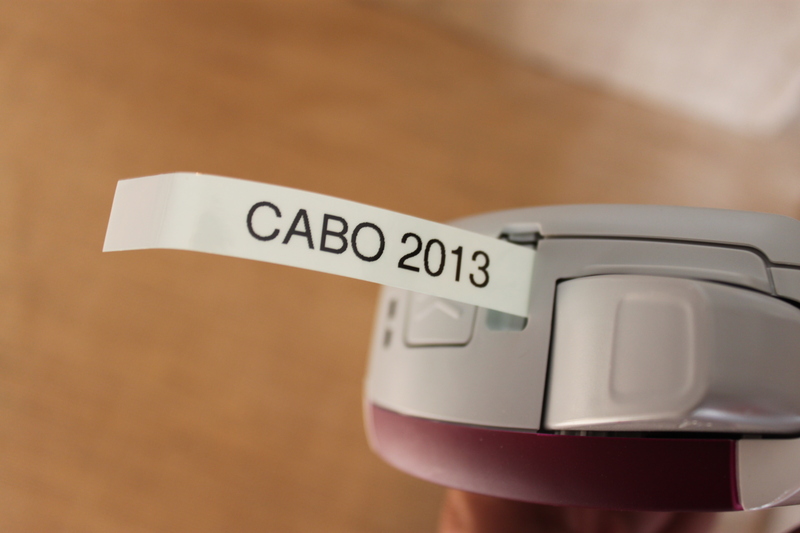 I’m inspired to do something similar, but I may try the clear tape they make for label machines, so the black font is all you see against the glass. You two have a fabulous home and your chronicles offer excellent design ideas, inspiring DIY projects and useful organization techniques. Best to you. Clear tape? They make clear tape? Get outta my way…..I’m headed to Office Depot! 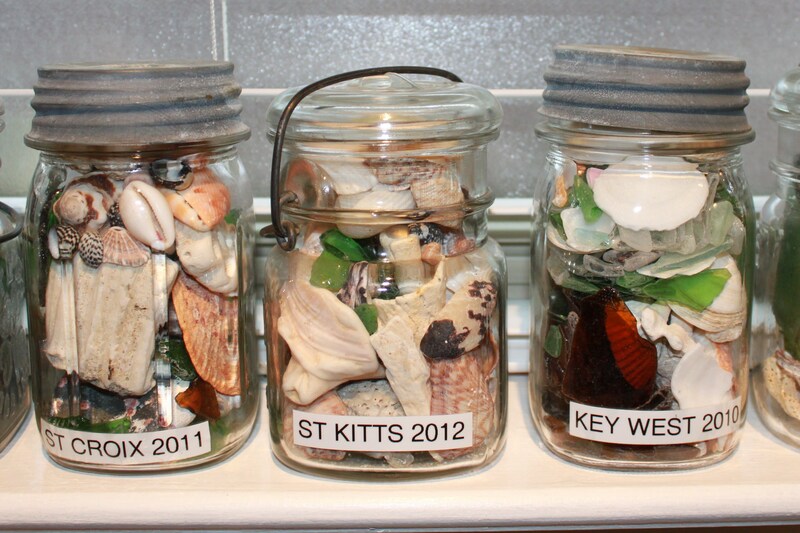 I grab a new jar every time we take a trip…..and have an empty one right now for our Florida trip next month. Thanks for the love, you have made our Wednesday morning , we work hard at this and it’s nice when people notice!